Marie-France Lévesque former American Ballet Theater Ballerina (under the direction of Lucia Chase and Mikhail Baryshnikov) is the Founder & Artistic Director Choreographer & Dancer of the Los Angeles Dance Company with choreographers Patrick Frantz former principal dancer at the Paris Opera Ballet, Craig Williams from the American Ballet Theater, Mark Lopez former principal dancer with the San Francisco Ballet. The Los Angeles Dance Company is a classicaly trained, culturally diverse professional dance company, blending traditional, neo-classical & contemporary ballet with some latin and ballroom flair! 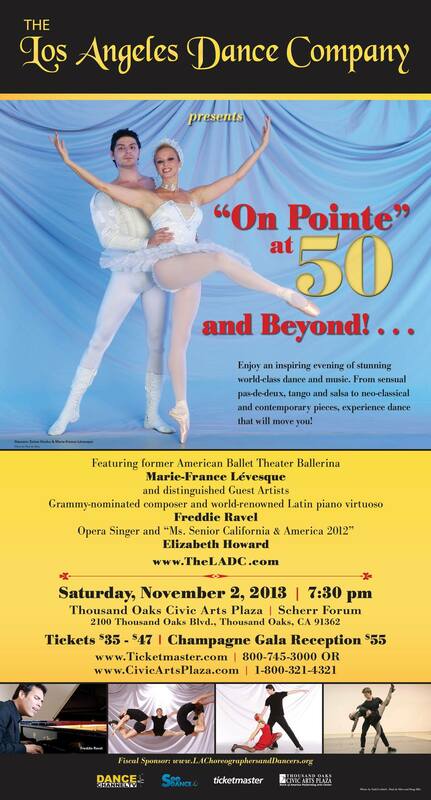 “On Pointe” at 50 and Beyond! is an inspirational and motivational performance that encourages people of all ages, more specifically people over 50 and over, that they still can pursue their dreams, passions & aspirations and that even living through one of the worst economic times in cour country’s history they still CAN reinvent their careers and life and do something that will fulfil their soul , make them feel sef-realized with purpose & create the magic in their Life. The audience will be tretaed with internationally acclaimed star guest artists such as Grammy nominated composera nd latin piano virtuoso Freddie Ravel. Opera singer and “Ms. Senior California and America 2012” Elizabeth Howard and others. Join us in the celebration today and “Get up and Move!” and come join the movement on November 2, 2013 at the beautiful Scherr Forum Theater in Thousand Oaks, California. This entry was posted in Music Events and tagged "On Pointe" at 50 and Beyond!, American Ballet Theater, Elizabeth Howard, Everybody Move, Featured, Freddie Ravel, Los Angeles, Marie-France Levesque, Music Center, National Dance Day 2013, The LADC, The Los Angeles Dance Company. Bookmark the permalink.